The Visionary was a highly respected man who saw and interpreted dreams which guided his own and his people’s everyday lives. 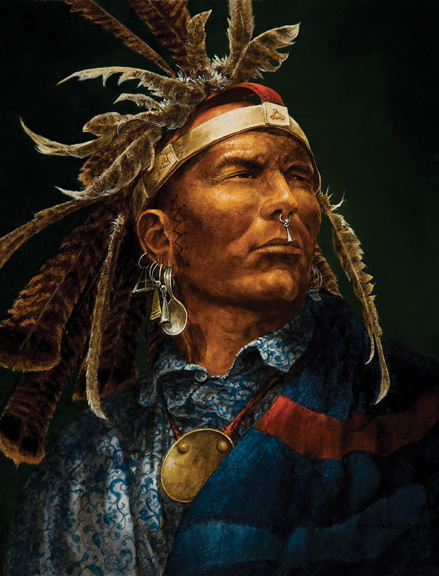 Dream visions governed the American Indians lives from simple decisions such as which path to take or complex and difficult choices such as whether or not to go to war. Tradition required Vision Seekers to admit failure and were taught to fear supernatural consequences if they lied. Many tribes allowed the successful Visionary to sell part of his power. By doing this he adopted someone who was less fortunate or inexperienced and taught them his sacred songs and procedures with the expectation that the adopted one would do the same to someone else in the future. The warrior in this painting is wearing a gus-to-weh or gastoweh. They were worn by members of almost all of the eastern woodland, Great Lakes and Great Plains tribes. There were minor construction differences, but mostly they were built on an ash splint framework whereby one splint encircles the head and two more cross over it. Numerous types of whole or split feathers were attached to the top and frequently a single eagle feather extended backwards from a central socket. Usually each feather used had special meaning. His shirt is a paisley block print pattern with a ruffled front and was a prominent part of the fancy dress of the eighteenth century American Indian men. He is wearing a bronze gorget which was a common neck decoration. He also wears silver and brass ear bobs and ball/cone earrings. Everyday objects were frequently used as decoration such as the silver spoon worn in his ear.